A Year of Being Here: Laura Davies Foley: "Sophie"
vanishing into someone else's room. her hand pulsing in mine like a heartbeat. seeing me, her transforming smile. I sit holding her hand, she, holding mine. 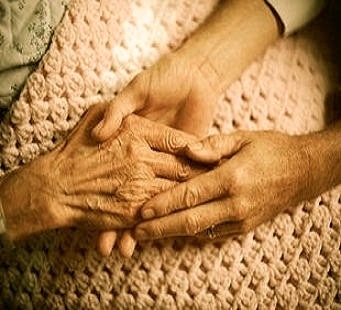 Art credit: "Holding an Elderly Woman's Hand," photograph by Sarah Broadmeadow-Thomas (originally color). What a subtle, gentle poem. It broke my heart in the best possible way and I found myself reading and re-reading, wondering how you'd done it..."Sophie" - it's lovely.